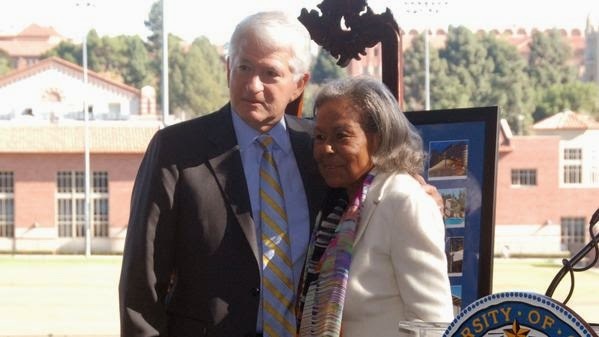 During his speech, Block focused on the influence that Robinson still has on the UCLA community today. Newest Dodger Adam Liberatore is on twitter. You can follow him here: @adamlib21. Via Jennifer Karmon at Spaces on Yahoo, "Clayton Kershaw buys family-ready home base in Los Angeles." Wow! He's got quite a nice place in Studio City now. Clayton Kershaw and his wife, Ellen, purchased a house in the Valley for $4 million, scarcely 10 miles from Dodger Stadium. The high school sweethearts (dating back to ninth grade!) are expecting their first child, a daughter, in January. Via Eric Stephen at True Blue LA, "Joc Pederson done with winter ball." Via Mark Langill at Dodger Insider, "1956: Don Newcombe, Sal Maglie and Brooklyn’s last hurrah." Via Cary Osborne at Dodger Insider, Clayton Kershaw on collectors’ Mount Rushmore." Kershaw cards have taken off in value of late. In early December a documentary about LA Kings announcer Bob Miller will open at Regal Cinema L.A. LIVE (across the street from STAPLES Center). It'll begin on December 5th and will run for a minimum of one week. All proceeds from ticket sales will go to the Kings Care Foundation. The documentary is called "Voice of the King." Below is a trailer. Go here for the website.